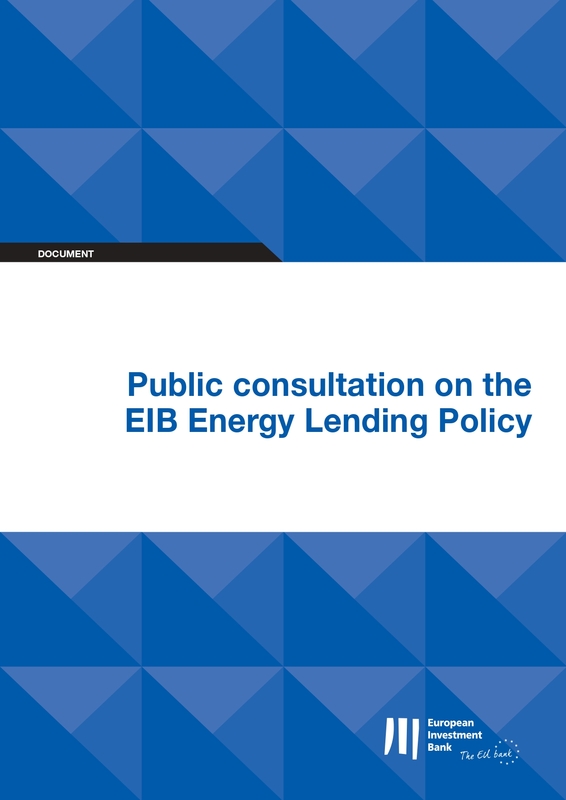 The European Investment Bank (EIB) ran an open consultation about its Energy Lending Policy. In what regards energy efficiency, the consultation proposed three different questions that you can see here. The EIB, as the European Union (EU) Bank, plays a significant role in financing energy infrastructure. The Bank’s current approach towards supporting the energy sector is set out in its Energy Lending Criteria (ELC). These were adopted six years ago, in the context of Europe’s 2020 targets. EU-ASE members were encouraged to provide their feedback with examples of energy efficiency projects that benefited the EIB financing. Within the broad areas of renewables, energy efficiency and energy grids, are there particular areas where you feel the Bank could have higher impact? The European Union has estimated that to meet its 2030 climate and energy targets, around €180 billion would be required every year until 2030 in extra investment in energy efficiency, renewable energy, and clean transport. This figure needs to be further revised given that it uses a 2016 reference scenario and only a 30% energy efficiency and renewable energy targets for 2030, instead of the recently agreed targets of 32.5% and 32% respectively. Together these revised targets would lead to 45% GHG emission reduction target, which is still below the required reduction pathway to achieve the Paris Agreement objective. According to the IEA modelling, energy efficiency makes the largest contribution to global emissions reduction and in the EU, energy efficiency can deliver 76% of the emission reduction required to achieve the Paris Agreement commitments. Thus the EIB should invest more in energy efficiency projects across all economic sectors, and focus particularly on those with high potential for energy use reduction, such as buildings. Building renovation projects, intended for both energy savings and buildings’ integration into a connected energy, storage, digital and transport system, deserve specific attention, as it is here that the EIB lending could have the highest impact, contributing to fill an estimated investment gap of 130 billion/year by 2030. In order to increase investments in energy efficiency projects and promote the integration of the Energy Efficiency First principle. Further develop programmes that provide technical assistance for energy efficiency projects (e.g. upscale the Elena funding). How can EIB reinforce its impact towards ensuring affordability, addressing social and regional disparities and support a just energy transformation? While the EU is currently defining its vision for a climate neutral future, we are confronted with several challenges that can be addressed thanks to the support from the EIB. The three main challenges are without a doubt: increased investment needs in the energy sector, rising energy poverty and growing disparities among European regions. While over the next decade, energy related investments will have to double, millions of European citizens expect a transition that will tackle the devastating impact of climate change and energy poverty in Europe. Indeed, more than 50 million people across Europe live in energy poverty and are unable to pay their energy bills. The energy transition provides us with a concrete opportunity to alleviate energy poverty in Europe if, across all sectors, ambitious measures to increase the rate of energy efficiency improvement are put in place. The EIB energy lending policy can significantly help to address this problem and lead the way to a sustainable future for the good of citizens, businesses and the environment by making energy efficiency first an imperative principle of its investments decisions. In order to support a just transition and help low-income Member States and their regions that might face a more difficult path to decarbonize their economy, the EIB should provide assistance for developing transition plans that consider the specific needs of areas where the economy is still heavily reliant on fossil fuels. The investment outlay necessary to decarbonize the energy sector in these areas is significant, and the EIB should think of ad hoc instruments and financial support for Member States with GDP per capita below EU average. To reinforce its impact towards a successful energy transition the EIB should cooperate with national development and commercial banks in each country. The EIB’s instruments should be complementary and work together (rather than compete) with national energy efficiency programmes. In the case of new buildings, do you have an opinion on the proposed approach to support only buildings that go beyond the mandatory nZEB standard after 2021? What level of ambition should the Bank focus upon, inside and outside the EU? In Europe, the buildings sector is responsible for around 40% of final energy consumption and nearly 36% of total direct and indirect CO2 emissions. 97% of the EU building stock is still in urgent need of an energy efficiency upgrade (cf BPIE). This is why if the EIB wants to achieve real impact it should support new and existing buildings and their deep staged renovation. According to the revised EPBD, each Member State needs to establish a national long-term renovation strategy to support the renovation of residential and non-residential buildings, into highly energy efficient and decarbonized building stock by 2050, facilitating the transformation of existing buildings into nearly zero energy buildings (nZEB). We also suggest exploring the possibility of creating a financing framework that would help Member States achieve highly efficient and decarbonized building stock by 2050 and to enhance smart technologies and technical building systems. In this way the EIB would properly contribute to the financing of the kind of infrastructure that will be needed as part of the future smart and energy efficient system. The Bank has developed a number of financial and technical assistance products to help promote energy efficiency in private and public buildings. Have you had any experience with these products? If so, do you have a comment or opinion as to how they can be further developed or improved? We often hear that EIB’s lending is not accessible for many local authorities, in particular for smaller and medium-sized municipalities, due to the fact the application process demand high investment and significant human and technical resources. This limits the access to financial and technical support for energy efficiency projects in a large number of smaller and medium-sized cities. Regarding the technical assistance (in particular the ELENA mechanism), the simplification of application procedures should be considered, especially when it comes to enabling partnerships between public and private sector for buildings renovation projects. Public-private cooperation should be promoted to ensure the needed technical assistance for municipalities. The EIB has the potential to play a key role in supporting Member States in the development and promotion of the Energy Performance Contracting model for comprehensive public building renovation. EIB’s lending for energy efficiency should be aimed to maximise the opportunities offered by the recent revision of the accounting rules for public building renovation under Energy Performance Contracting (EPC). In addition, to further increase the uptake of EPCs, the EIB should facilitate the combination of EPCs and ESIF funds and provide specialised technical advisory for municipalities. In light of the long-term nature of the network development plans, which type of projects should the Bank focus upon? In addition to PCIs, should the Bank prioritise newer investment types, for instance in digital technologies? The bank should focus only on sustainable projects, the ones that will not be detrimental to the Paris Agreement. The role of the EIB should be to accelerate and deepen the energy transition, not to slow it down by continued investments in new fossil fuels infrastructure with long-term lock-in effects. Therefore, we support a revision of the TEN-E regulation, as included in the deal that was reached early March, between the European Parliament and Council on the Connecting Europe Facility. The aim should be to align the TEN-E Regulation (and the subsequent Projects of Common Interest, PCIs) with the Paris climate agreement. Awaiting that revision, the EIB should abstain from automatically supporting PCIs projects, since other assessments are needed to ensure that all EIB-supported projects are in line with the Paris Agreement. This is all the more important that funds could be rerouted towards investments in energy efficiency and demand side response, which can have significant security of supply impacts. The current economic appraisal methodology focuses on physical supply disruption of big infrastructure projects, looking at the impact of largest piece of infrastructure not being available. The Bank should adapt this methodology so that the aggregate effect of a large energy efficiency or demand side response programme can be quantified as well. In addition to PCIs, the EIB shall consider new fields of investments such as Distributed energy systems (DES) such as high efficiency and low carbon district heating networks and new types/categories of projects, covering for instance the energy efficient renovation of entire neighbourhoods and districts. Local and regional energy transition initiatives should be at the heart of the Bank lending policy as energy transition and effective decarbonisation can only be adequately constructed and carried out at the level of territories. New digital technologies should also be areas of interest of the bank. What is your view on the investment needed in gas infrastructure to meet Europe’s long-term climate and energy policy goals, while completing the internal energy market and ensuring security of supply? What approach could strike the right balance to prevent the economic risk of stranded assets? The EU needs to be consistent across its public funding and EU policies regarding a clear pathway towards a net zero emission economy. That is needed to provide private investors with the certainty that they can invest in new (clean) technologies, production facilities and the like. Continued investment in fossil fuel projects is inconsistent and incompatible with the Paris Agreement and long-term decarbonisation targets. That means that the EIB should not invest in new fossil fuel infrastructures and by doing so, misuse scarce public resources. Investing in new fossil fuels-based facilities would lock-in investments in technologies of the past for decades to come and lead to the creation of stranded assets. Instead, we need to invest in the future efficient energy systems, which will bring multiple economic, environmental and social benefits. In addition, and as mentioned above, the EIB should fully apply the Energy First principle and therefore require from projects promoters to systematically assess the economic opportunity to reduce energy consumption first, through cost effective energy efficiency solutions, before investing in any new sustainable supply capacities. In our view, all investment decisions in the field of energy and climate change must be guided by the long term decarbonisation objectives. Faced with the challenge of scarcity, public resources should be spent in the most intelligent, efficient and effective way, paying due attention to aspects such as just transition, and prioritizing areas with the highest economic, societal and environmental value, such as efficient operation of buildings and their comprehensive renovations. EU-ASE is grateful for the opportunity to submit a response to this public consultation and welcomes the European Commission’s initiative to undertake a Fitness Check on the Water Framework Directive and the Floods Directive. EU-ASE believes that these REFIT Evaluation provide a timely opportunity to understand how these well-established legislations should be updated in light of the European long-term energy and climate strategy and increasing demands on Europe’s water resources. The 2012 Blueprint to Safeguard Europe’s Water Resources identified several gaps in the EU’s water policy agenda including the need to integrate a water dimension into other EU policies in order to address all aspects of water use and consumption.1 One of the important themes identified in the Water Blueprint is water efficiency and resiliency which looks beyond specific water quality issues to address more broadly issues of water quantity and water use. Taking such an approach is even more important in today’s context of increasing water stress and competition for water resources amongst a growing population and the needs of agriculture and industry. The REFIT evaluation offers an opportunity to consider water policy in terms of the EU’s sustainability agenda, including the circular economy principles and energy and climate considerations. In this regard, principles of sustainable water management should be mainstreamed across all EU policy making and in particular with regard to more refined guidance that promotes water treatment, distribution and usage, as well as energy efficiency. As energy plays a key role in production, transfer, distribution and treatment of water and wastewater, it is necessary to optimize its usage to increase the level of sustainability and to minimize specific costs. We consider that the EU has much to gain from considering the “energy-water nexus” in all EU policies, both in terms of making Europe’s waters more resilient and in terms of supporting Europe’s energy efficiency objectives. Accordingly, we encourage the Commission to look closely at these areas in its REFIT evaluation. On this basis, EU-ASE would like to make the following comments to support the Commission in its ongoing work. The Water Framework Directive has its main objective to protect freshwater sources. According to the report of the European Environmental Agency2, Europe’s waters are affected by several pressures, including water pollution, water abstractions, droughts and floods. The same report considers sustainable water management as a critical element to ensure healthy and resilient ecosystems. At the same time, however, water resources are being lost as a result of leakages in distribution networks and inefficient water technologies. All this is a significant cost both from a financial and resource perspective. At present, around 24%5 of all treated water in public water supplies is lost within the distribution network as a result of leakage. In some municipalities, this figure rises to 60%. This means that around one quarter of the drinking water for the public must be treated again to enable access to clean drinking water for human consumption, adding to the high energy consuming profile of the drinking water sector. In this context, the sustainable water management encapsulates activity at several levels: the minimization of water usage through technological and systemic efficiencies, the elimination of water and waste water leakages in the distribution systems to reduce water abstraction, the digitalization and use of real-time data to measure water consumption and use for critical analysis, the optimization of energy performance of industrial processes and wastewater treatment, rain water management through green infrastructure and innovative solutions such as the recirculation of domestic water to reduce water and energy consumptions in households. Furthermore, in order to contribute to a more sustainable management of water, we suggest updating monitoring rules of the Water Framework Directive in line with technological innovations available on the market, including intelligent sensors, network and digital solutions. Reducing energy waste in the water policies makes economic and environmental sense as it delivers tangible, multiple and collective benefits to European citizens and businesses and should be a priority for an update of the Water Framework Directive. This update should include specific linkage to EU energy efficiency legislation and opportunities to promote energy and water saving solutions. The replacement of the old infrastructure with energy efficient solutions can be achieved at a positive return on investment when considering the energy savings over the life time of the new products and systems7. As such, the EU Member States should provide policy and financial incentives to enable industry to take action. In the perspective of promoting energy efficient solutions, the water sector would also benefit from adopting public procurement rules based on the full cost of ownership and not just on the up-front capital investment of the solutions and systems that are specified. The REFIT of the water framework directive is an opportunity to support sustainable investments by linking in the Green Public Procurement Directive. In conclusion, EU-ASE believes that applying sustainable water management and energy efficient measures, can lead to a more sustainable water management that is in line with the Sustainable Development Goals, the Paris Agreement objectives on climate change and the urgent path towards climate neutrality by 2050 at the latest. We hope that the comments above can be useful in the debate surrounding these REFIT Evaluations. We remain at your disposition for further discussion and to answer questions on this important topic. EEA Report No 7/2018 – European Water Assessment 2018, European Environment Agency. Charting our water future, 2009, 2030 Water Resources Group. Report on the Review of the European Water Scarcity and Droughts Policy , 2012, European Commission. Powering the Wastewater Renaissance. Upgrade an industry and cut global emissions in half … at neutral to negative cost, 2015, Xylem Inc. 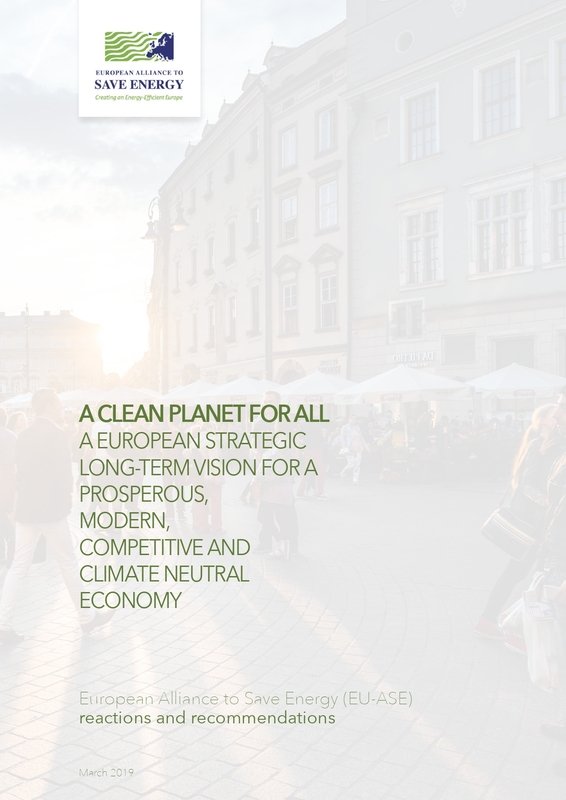 In this document, we summarized our reactions to and recommendations on the European Commission’s communication A Clean Planet For All. More information on our views concerning the EU long term energy and climate strategy are available in the EU-ASE position paper “Energy Efficiency accelerating the shift to a decarbonised Europe” published in October 2018. We welcome the European Commission’s vision, but call for further efforts to step up climate action and reach decarbonisation by 2050. Energy Efficiency must play a key and central role in the road towards a Climate Neutral EU. 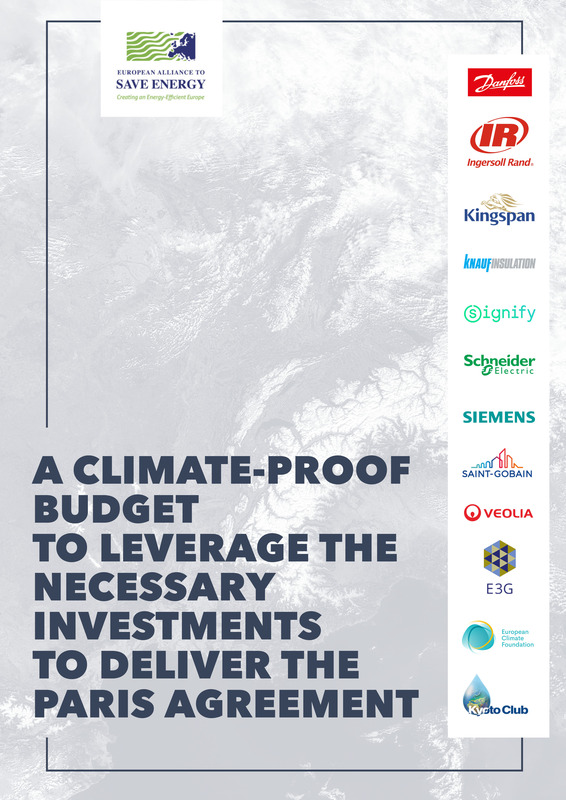 It is the most cost-effective way to achieve GHG reductions, align actions with the Paris Agreement and reach a maximum global temperature rise of 1.5ºC as stated by the IPCC report as the best way to slow down climate change. EU leaders must act NOW. The transition is feasible but very urgent. EU-ASE is eager to act together with citizens and decision-makers to shape the EU’s energy future in a just, inclusive way. Climate change is defining our era. If our behavior doesn’t change, we risk missing the moment when we can avoid the disastrous consequences of climate change, for people and for the natural systems that support us all. We are at a defining moment. 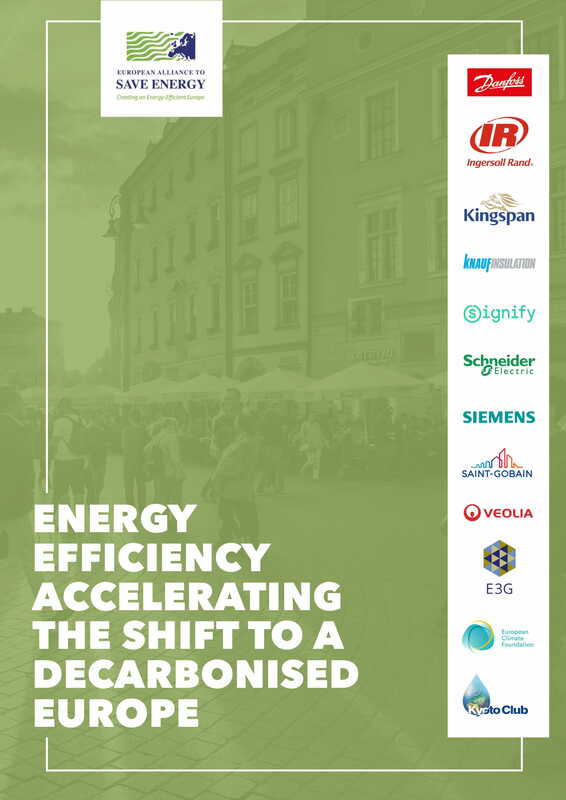 The businesses call for a net-zero emissions reductions by 2050 at the latest, with the need for placing energy efficiency and smart use of energy at the center of the EU decarbonisation strategy.